If your cat is a little too fluffy and that luscious coat isn’t to blame, you’ve come to the right place! 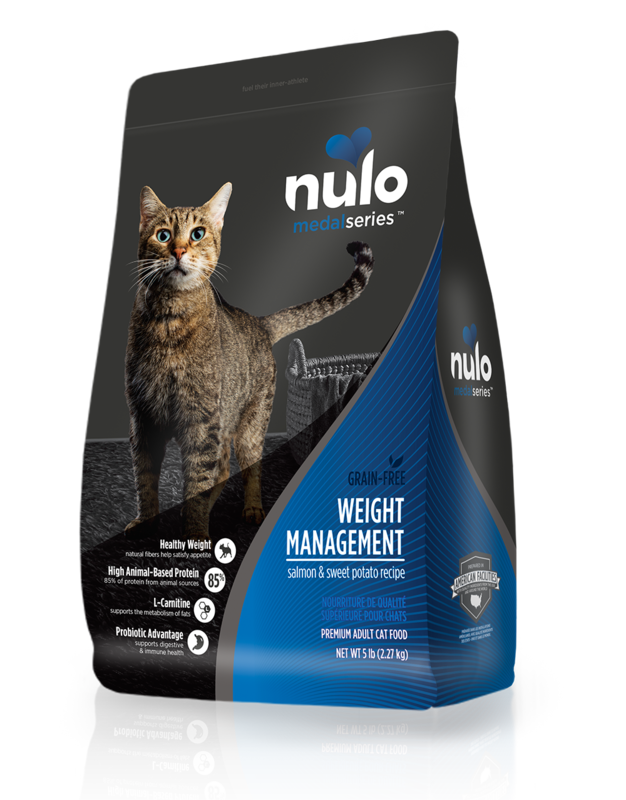 With Nulo’s MedalSeries Weight Management Recipe, your special cat will receives all of the nutrition he or she needs without the extra calories! With deboned salmon as the first ingredient, paired with wholesome sweet potatoes and green lentils, your cat won’t have to sacrifice quality or taste on the journey to reaching an ideal weight! Designed with less calories from fat, along with the addition of L-Carnitine to aid in the metabolism of fats as a fuel source, this recipe will give your cat the extra support he or she needs to become fit again! AVAILABLE IN 2 LB, 5 LB AND 12 LB BAGS. Deboned Salmon, Turkey Meal, Chicken Meal, Dried Sweet Potatoes, Deboned Cod, Whole Peas, Green Lentils, Herring Meal, Miscanthus Grass, Chicken Fat (preserved with Mixed Tocopherols & Citric Acid), Flaxseed, Natural Salmon Flavor, Dried Chicory Root, DL-Methionine, Dried Cranberries, Dried Kelp, Calcium Carbonate, Choline Chloride, Yucca Schidigera Extract, Taurine, L-Carnitine, Zinc Proteinate, Vitamin E Supplement, Zinc Sulfate, Iron Proteinate, L-Ascorbyl-2-Polyphosphate (source of Vitamin C), Niacin Supplement, Ferrous Sulfate, Copper Proteinate, Copper Sulfate, Vitamin A Supplement, Manganese Proteinate, Thiamine Mononitrate, Calcium Pantothenate, Riboflavin Supplement, Pyridoxine Hydrochloride, Manganous Oxide, Biotin, Dried Bacillus coagulans Fermentation Product, Vitamin B12 Supplement, Vitamin D3 Supplement, Folic Acid, Sodium Selenite, Calcium Iodate, Rosemary Extract. MedalSeries Cat Weight Management Salmon & Sweet Potato Recipe is formulated to meet the nutritional levels established by the AAFCO Cat Food Nutrient Profiles for all life stages.